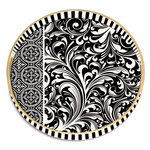 A stunning large, round wooden tray with painted sides and gold edging. You can use it on a desk, at the bedside or for serving food & beverages. Non-slip rubber feet to protect surfaces. 14" x 14" x 1.5"